READ THE INSTRUCTIONS BEFORE PROCEEDING, SEE BELOW. Right click the "Entire database" folder in the right sidebar. That will open the advanced search boxes. Left click the "Entire Database" folder in right sidebar. that will drop down a menu of special topics folders that you can browse through. To view the full record click on the "magnifying glass" icon at the far right of each entry. That will open the full record. Some records are full text. Some are just citations. 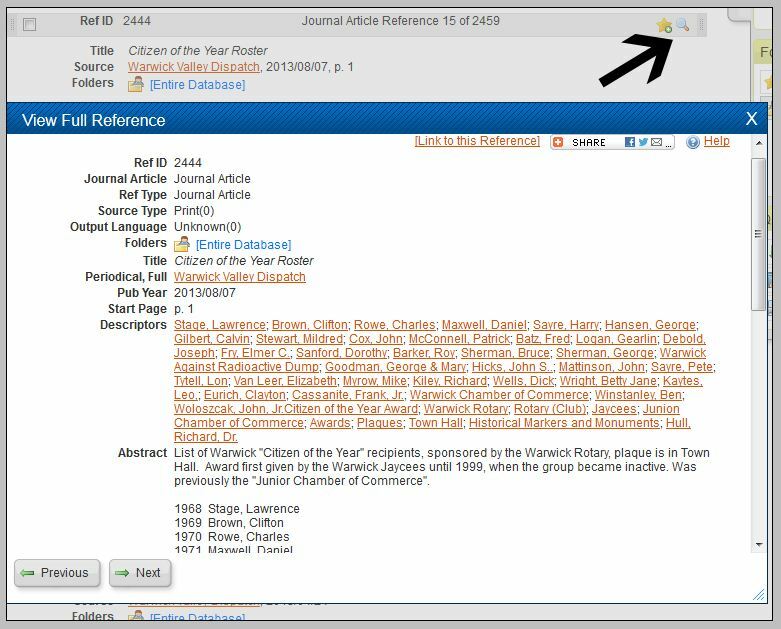 Some records have a link at the end of the entry to the full document or webpage. The Refworks website offers a number of ways to print using the guidelines of various academic formats. The easiest way to print the entry you are viewing is to open the full record, click and drag to select the text, "copy" the text, and paste it into a Word document or your email. That way you will get a cleaner copy, with less clutter of unwanted fields.